In The Root of Evil?, which is Richard Dawkins’ polemic against religion for those that may not know, Dawkins stated that we are all practical functioning atheists. His term is basically the same as your practical atheist. While I disagree with Dawkins on his larger points, here he is (mostly) right – and no more so than here in the West. This may be extreme, but I don’t see a difference between being a confessing atheist and being a practical functioning atheist. Dawkins’ point here is that we all go about our day without God on our minds. How often this is sadly true – especially in my own life :-(. I think Paul’s admonishment to “pray without ceasing” is language of the single-story life. If prayer is only these momentary homilies that are characteristic of the two-story approach then we can never satisfy Paul’s admonishment. I figured this out pretty early as I thought Paul was being impractical here; however, in the single-story approach, eating my lunch is a prayer of rejoicing to the God Who is there. I’m very much enjoying this series of posts. I had not read Dawkin’s stuff, though I’m aware of him. It’s interesting that he and I should agree on something like this – though for differing reasons. But it says to me that I am on to something in this thread, and that it’s worth continuing where it leads. Thanks so much. An excellent series of posts. It is this exact issue that attracted me to Orthodox Christianity. It is the difference between ideology and ontology. I would also suggest that the more secular the world becomes for Christians, the more political Christians will become. We will necessarily resort to the same tools and weapons as those who do not believe. It seems that, as one moves towards a more wholistic view of the world, one is more inclined to see the political questions of the day as relevant to the gospel of Christ. Issues of the care for the earth, third-world debt, international justice, etc. become even more relevant as we realize just how much God’s loving presence fills our world, and how creation itself groans for the loving reign of the sons of God. That doesn’t mean we use the same weapons and tools as unbelievers, but it does mean we consider “political” issues as within the bounds of what the church can speak to. I, in my own life associate with many people who are in 12 Step Programs, especially AA. In my talks with them(many, the majority) and in their meetings, this theme of a God far removed from them is cited as their main grudge against “organized religion”. If anything, this God they have left behind in His only interaction with them is a punishing, vengeful God and many of these alcoholics feel they would be crazy to return to Him as their “conception of a Higher Power”. In my history with these people, I heard one man say that he was “An agnostic in the sense that though he believed in God, he had no practical use for Him.” When I heard this, I adopted this for myself, realizing that I too am such a man. In my speaking to these people, it is always necessary to recapitulate Christian history to its beginnings and this time stress to them the Incarnation, to give them a radical view of the Christian Faith that they have never encountered before. Always, I do not spend time giving proofs of God, but I speak of these matters in an, “As if” manner. Meaning, in the course of recapitulating to the beginning, I attempt to draw them with me to the point in time when our Lord appeared. And I simply make a statement such as, “So, Bill, when God became Man,…..” and “And when He returns”…. Here’s the kicker for me. As I continue in the journey of our Holy Faith, I discover more and more that this language is the wisest of all even among Orthodox. A few days ago I had the opportunity to answer the question put to me by a non-Christian I knew whom I had invited to compline with me who wished to know what the difference was between the Orthodox Church and the Roman Catholic church. I opened my heart and soul and spoke the “one story” language to him. 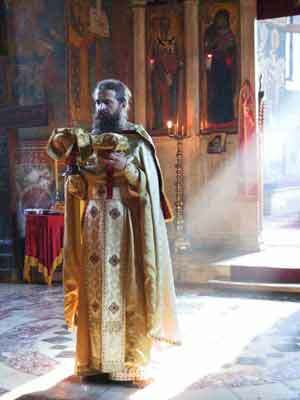 Witnessing this was a fellow parishioner who had come to Orthodoxy via Eastern Catholicism. He listened to what I told this fellow. We got into the topic a bit more as he believes differently than I as to the standing of the Roman church in relation to The Church(Orthodox). In his speech he brought to my attention that we both shared 7 Sacraments and my heart was grieved, much as I believe you mentioned yours is, Father, when you hear Orthodox speak of “7” Sacraments. (“Mysteries” sounds so much better to me than “Sacraments”). Also, I liked your speaking of some of our nation’s Founding Fathers as being Deists and not Christians. I, too, as an Evangelical would read “Providence” and assume I was hearing “God”. I assumed they were synonymous. On another, separate note, it should be noted that many of our Founding Fahters were also Freemasons which would explain their opting for Deism, where the Supreme Being remains in shadow and has not become flesh, to be known amongst us as one of us. Perhaps an interesting topic to pursue would be that if such is the case of our Founding Fathers, can America be considered to have been a “Christian Nation?”. As an Evangelical I used to believe(and preach) this but now, as you alluded to the use of believing in Concept rather than Person, I believe this may be closer to the truth. Thank you as always, Father for these wonderful posts. p.s. I said “Hi” to Father Eric from you and he says the same back. Fr. Stephen, These posts are a balm to my soul. May God bless you richly! This is just what I need to read at this time in my life and if I can put my thoughts into coherent sentences, I will expound on them. In the meantime, thank you, thank you! Sophocles – excellent post! Thank you. Wonders of Oyarsa – Yes, I think living on the first-storey with God does makes us far more aware of many things. But much that is political action or action by political bodies is only secular action, use of the power of the state for the ends of the state. Caesar will always be Caesar, I believe. We should care deeply about the things that matter, so deeply we do something and the something very likely should be more than vote. Though I do not advocate not voting. But voting and the Kingdom of God are not the same thing. When I think about these matters, I think about Christians becoming the answer rather than using the coercive power of the state to make someone else be the answer. Interestingly, one of the things I always liked best about St. Francis, was that during one of the Crusades, he simply took passage to the mideast and went to the court of the Sultan and witnessed to him about Christ. The Sultan listened and dismissed him, but did not kill him. It would be like looking for Osama Bin Laden in order to forgive him and tell him about Jesus. I can’t help but like such people and think there is more there than we allow. This is a very helpful series, Father Stephen. As I was vacuuming my home, more thoughts related to this series came up. One Storey language cannot be spoken about. It is lived and from the experience of living it, it comes forth. I agree with you in your remark concerning Richard John Neuhaus that the problem is other than what he said and that it is much deeper, sublimely so. A One Storey universe, by its nature, is “impossible” as it is part and parcel of the falleness of our *and* the cosmos’ current fallen state. A One Storey person, in the truest sense, is a Saint. As he inhabits the One Storey World, this habitation, this acclimating himself to that world where shadows dwell not, where Light shines forth eternally, such a person, suffused in the energies of the Holy Trinity “reports” back to us dwelling in our two storey world. We take his word at faith(if we possibly believe him). This man makes no sense to us as his language is born out of his experience in The One Storey World. He communicates clearly to us this Other World and how too we may enter but his words “translate” into Two Storey Talk and we understand him not. And I think, to tie into your overall post’s [assumed]theme, that America by default is Protestant, perhaps the envelope needs to be pushed further. Perhaps the “default” stage can be applied to the world. In the absence of The One Storey World( the entire cosmos divinized not only potentially but actually), a two storey Reality with all its people thinking their thoughts fill in the absence. So, the dilemma, as I see it according to your developing posts is to live a “one storey existence” or have being in one storeyness. This is accomplished through our Lord in His Incarnation, Death, Resurrection, Ascension and Second Coming. In His Person all things “finding” and fulfilling themselves. Salvation, then, is acquiring an ever growing “one storey-ness” in Him, by Him, through Him. Becoming Him. But once it is legislated that we must become One Storey Folk, this becomes a law, Death through the law sets in and the fractured Two Storey world by default once again sets in. So by its nature the One Storey World is gotten voluntarily, by love, by choosing to lay aside the Two Sorey world and its shadows. Any forcing of the issue as a must, imposed as a law, then once again – two storeys. As an aside, I believe this best explains the Roman church in that in legislating that the one storey be operative, and the attempt to formulate and perfect the means to achieve “one storey-ness” by system rather than Person; to “capture” and “establish” the One Storey World, here is two storey-ness in its most insiduous form, “Having a form of godliness but denying its power” (2 Tim. 3:5). All the right things are believed in, including the right Person and Persons, but by becoming law. The One Storey world can never be forced externally and captured or formulated to “package it” so to speak. Always and only by love, is the One Storey world to be found and entered into. This further, I believe, sheds light on our aversion of Orthodox adopting the two-storey view of creating artificial categories where “seven sacraments” makes sense, yet prevents the hearer into entering his entire existence as sacrament or Mystery. Anyway, Father, thank you for listening. I look forward to upcoming posts. In your recent posts about the one and two storey universe, you have been dealing with a number of themes that I have been working on as well, and it is a pleasure to see how you have handled them. Somewhere along the spectrum from Orthodoxy to Christian Atheism must surely be placed the Secular Christians who make up most of what passes for evangelical Christianity. One of my parishioners reads your blog and has found the series very helpful, and he has has let slip that he thinks you and I sound a lot alike in what we say. Of course, I am flattered to be compared with you, though you may regard the comparison with dismay. I still have my notes from your presentation to the Pastoral Life Conference at St Tikhon’s a few years ago. You’re making my job easier. Keep up the good work. A noted exception to your observations. Perhpas the most “one-storey” life any of us have witnessed in our lives was that lived my Mother Teresa. Saints happen where and when they happen, thank God. And usually mess up anything we figure out. For which I’m grateful. No. Indeed, I’m flattered. I hope we all have a “likeness” we share. Mind you, when I speak of of “Christian Atheist” I don’t mean anyone who would consider themselves atheist, just that they would functionally be so because God has been exiled mentally to the “upper storey.” I think that you are correct that there are varying shades of this. And I know it has a place in my own life despite my efforts to eradicate it there. But, God is merciful. Thank you for your kind words – may paradise indeed consume us! Could you talk a bit about how a two storey universe and one storey universe differ in how we understand evil in the world? Yes. May need to think a short bit about how to present it. What would be the role of science in this? It seems that, in order to actually do science, one would have to assume the stance of the practical atheist, a stance that would be merely methodological, not noetic. In other words, can practical atheism be useful for practical, scientific, and technological purposes; even if it lacks fullness as a way of actually living one’s life? If so, could practical atheism be seen as one of many perspectives (none of which alone are sufficient) within a larger Christian worldview? I don’t think there is any activity as a Christian that I properly engage in and intentionally discard God. When I’m adding a group of numbers, I can still pray, give thanks – as a Christian it is learning to live with my heart in union with God. Is there any scientific activity that requires a married man to act as if he is not married? If you’re asking questions about say cosmoslogy, God has hidden Himself in many ways, such that it is quite possible to describe the universe, even the big bang, without having answered questions about God. I am a believer and I don’t think anything happens without God, but I cannot test that in a laboratory other than the living lab of my life. Yes, Mother Theresa was definately a One Storey life (in the limited fashion I am able to make this determination). I meant to make the gist of the whole statement that the “bottling” or “packaging” of “one storey-ness” automatically creates a two storey world. I believe that a one storey life is impossible for anyone, including for the Orthodox, but as “With God all things are possible”, the “impossible” one storey life is to be lived, believing on Him, taking Him at His word that He desires to know us. I intended to point to the danger of institutionalizing one storey-ness as I believe it cannot be and hence the sense of unease I feel when fellow Orthodox use the terminology that is not part of our Tradition(as I currently understand it) in order to respond to our Western friends’ attempts to categorize the Life in Christ in terms such as “Seven Sacraments”. I hope I made a little more sense? Practical Atheism sounds much like the Stoicism of Epictetus. I think meaning and motive is always worthy of thought be there a God in it or not. A one-storey approach makes praying for the “dead” a lot more senseable and reasonable don’t you think? Doesn’t the one-storey approach mean that we have the ‘basement dwellers’ living amongst us as well? (1) The roots of modern atheism can be found in the Greek philosophers (Aristotle, etc. ), who were rediscovered during the Renaissance. (2) Modern atheism grew out of the thoughts and methods of Christian scientists who sought to understand the material world in mechanistic (material) terms, using the language of science as it developed. (3) The Protestant Reformation cut loose the strings of dogma that held people to a single world view, allowing “rational thinkers” more freedom to ask questions and challenge assumptions. (4) The Deists were a natural progression from this, and from deism to atheism is a short step. (2) “The Reformation meant that for the first time in its 1500 year history, there was no longer one unified ‘Catholic’ church.” This statement seemed to display an enormous ignorance of church history, and/or ignorance of the Eastern church. These two statements caused me to wonder what other inaccuracies there were in the documentary. Nevertheless, I think the basic thrust echoes some of what I’ve heard you say here (and in your earlier posts on atheism). For those interested, I looked up the documentary. It was part 2 of 3 titled “Noughts and Crosses” of Jonathan Miller’s “Brief History of Disbelief”. Here is the BBC website for the series. Don’t know much more about the program than what is on the page, and the portion I saw last night. The first scientists were alchemists and natural philosophers who were devout Christians, who held that God revealed Himself in two books, the Bible and the Book of Nature – it was only later that scientific materialism came in. The term scientist was not widely used until the 19th century. Being from Jersey, I grew up in a small cluster of towns that had least a dozen or so different churches from different traditions. Now, I go to a CoC that, like you say, doesn’t even believe in an active God or in miracals anymore. I get chastized if I mention the belief – despite being an atheist, I still believe in miracles, if you think a miracle to be something that happens against what should be dictated. When it comes to our increasingly secularized world, I think of it this way. The wealthy have long had a harder time trusting in God. Europe, North America parts of Oceania – we’re the rich class. Places like S. America and Africa and even parts of Asia are seeing a revival or renewal of Christian faith because since have almost no wealth, they need to have something else at least to hold onto. I might not have faith anymore, but sometimes I just long to go back to the East Coast and visit the churches of old and be surrounded by faiths rich in tradition. Sometimes tradition not “found” in the Bible was meant more to help us bond as one people instead of “twisting” and “paganizing” the faith. Christ Himself said that it’s easier for a camel to get through the eye of a needle than for the rich to enter the Kingdom of God. Thus the non-faith of the rich is not a comment on the existence of God – just a comment on the emptiness of wealth. Your instinct for miracles is a good thing. I believe they surround us at every moment were we to be able to see things correctly. There is a richness in the tradition of the faith that is completely unknown to the relatively modern ideas of Protestantism. They genuinely threw the baby out with the bath. Paganism is not nearly as frightening as the emptiness of our modern world. The kind of godlessness “of our modern world” was unthinkable to pre-Christian pagans. The pagans understood that worship was essential, even to point of covering their bases by giving honor to “unknown gods,” a la Paul’s Mars Hill sermon. To worship what is “not” God in the form of “graven images” is the pagans’ delusion, but real emptiness is the result of choosing a much darker path, the one followed in the last century. The body-count of that path is still being tallied. This article is truly brilliant and has real meaning in 21st century America. Thank you!